The act of surreptitiously or secretly entering through a window: While Sam and his family were visiting friends, when they got home later in the evening, they discovered that someone had made an adfenestration into their home and stole some jewelry and cash. The throwing of oneself out of a window or when someone jumps out of a window. Defective development of the calvaria (dome, roof) of the fetal, or unborn child's skull, with areas in which no bone is formed. 1. To throw something out of a window: Before toilets were invented and widely used, people in the past defenestrated their human wastes out on the streets in cities and were even defenestrating such excreta on people who were walking by the buildings below. 2. 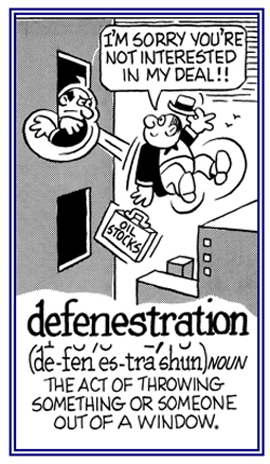 Etymology: The verb form was actually derived from the noun defenestration, and is composed of de-, "from, of" + fenestra "window". 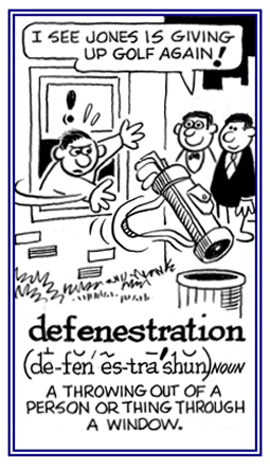 Fenestra is used in French fenêtre and in German Fenster. Although the following image represents a noun, it also illustrates the meaning of this verb. 1. A reference to something that is thrown out of a window. 2. In computer language, indicating the removal of a Windows's program from a computer. One of the two major types of narrow tubes found in the intestinal mucosa, renal glomeruli, pancreas, endocrine glands, and other tissues: The denestrated capillaries are characterized by circular fenestrae or pores that penetrate the endothelium and may be closed by a very thin diaphragm. 1. In anatomy and zoology, a small opening or perforation, as in a bone; especially, between the middle and inner ear; a window. 2. A transparent spot in an otherwise opaque surface, as in the wings of certain butterflies and moths. 3. Any opening resembling a window, as in some plaster casts, surgical drapes, or surgical instruments. 4. In architecture, a window-like opening; such as, in a wall. The opening into the duodenum made by the common bile duct and the pancreatic duct. A small, rounded, recessed opening in the medial wall of the tympanic cavity, located behind and below the fenestra vestibuli, under cover of the projecting edge of the promontory and communicating with scala tympani of the cochlea from which it is separated by the secondary tympanic membrane. The two window-like, membrane-covered openings between the middle and the internal ear. A membrane-covered opening between the middle and inner ears in amphibians and mammals through which energy is sent after traveling in the membranous labyrinth: The fenestra rotunda is a small opening; especially, either of two window-like apertures in the medial wall of the middle ear. 1. A reference to a window with translucent material instead of glass. 2. Of or like a window that is perforated with translucent spots. In medicine, to create one or more openings in a tissue. A cross reference of other word family units that are related directly, indirectly, or partially with: "opening, hole, cavity, tract, tube": alveolo-; antro-; anu-; celo-; coelio-; concho-; hernio-; hiat-; meato-; ora-; parieto-; poro-; pyl-, pyle-; pylor-; sphinctero-; splanchn-; stomato-; syringo-; uretero-; urethro-; vagino-; ventricul-.